Amazing sailboat for charter in Barcelona. 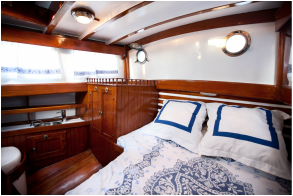 Capacity up to 7 people for day charter and beds for maximum 5 people for higher overnight charters. Enjoys under sail at its best with a ship from another era but with the comfort and current technology. Deck equipment: genoa, main and mizzen, LED navigation lights, wind, autopilot, LED lighting in cockpit, tender with outboard, teak deck, shower, bimini. Interior: TV, HIFI , MP3, indoor and outdoor speakers, battery charger converter 12V / 220V (350W), kitchen with oven and burners, fridge, water heater, 1 bathroom with shower, 1 toilet, lounge with convertible table, full kitchen. Skippered boat. VAT 21%, boat insurance and occupants, mooring in Port Olímpic de Barcelona, dinghy, snorkeling. Fuel, mooring in different harbor than Port Olímpic, supplies. Bed equipment (option): € 15p.p. Towels: (option) € 5 p.p. We treat confidentially the information, in any case shall not be provided to third parties under any pretext.